We arrived in Airlie Beach super early on Monday morning, after a very sleepless overnight bus journey, and luckily we were able to check straight into our hostel, where we just crashed out until the afternoon. The it was off to the OZ Sail office to check in and find out what we needed to do for our 2 day, 2 night sailing trip starting the next day. 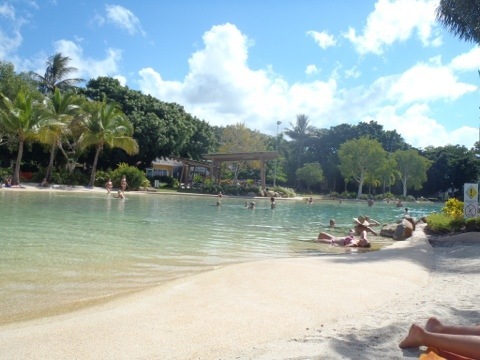 Once that was all sorted we headed to the Airlie Beach Lagoon, a man-made (and very warm) swimming pool situated just next to the sea. As there are lots of jellyfish you can’t actually swim in the ocean unfortunately. We hung out there for a few hours, just lazing about in the water before going back to the hostel for a much needed shower and some food. It was early to bed that night…I think we knew that the next two days were going to be exhausting. The day had arrived. A day we’d been looking forward to for weeks and weeks, ever since booking our adventures back in Byron Bay. 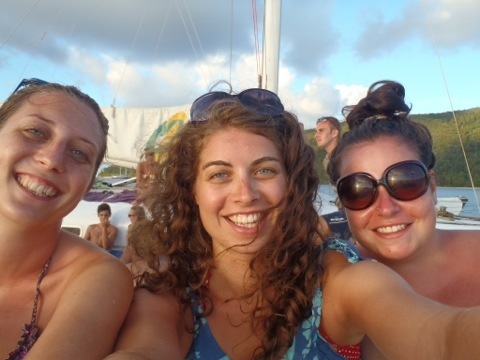 We were about to go sailing in the Whitsundays! We didn’t make the best of starts though, as we were told to arrive at the marina by 11:30am, when in fact we were supposed to be there at 11! The rest of our group (there were 24 of us in total) were waiting when we arrived…whoops! Delay over, we all traipsed down the dock to where our boat, an old racing Trimaran called ‘Avatar‘, was sat, ready for our arrival. Once on board the boat, we met our crew, Skipper Neil, Deck-Hand Matt and Host Amy, all absolute legends and set to make the next few days amazing. After a quick briefing, and organising sleeping arrangements (we were in the main cabin…pretty comfy and roomy but so, so hot), we were off! The weather was gorgeous, the views were incredible, I really couldn’t have asked for anything more. After a couple of hours it was time for a lunch of pies and salad, a good way to break up the hours before we made it to our first snorkelling stop. Everyone donned their very *ahem* attractive stinger suits (there are heaps of jellyfish around the Whitsundays), but I was already pretty comfortable in my sunbathing position on the boat’s netting, so decided that this time I wouldn’t get in the water (plus I’m not really a massive fan of big, open water), but plenty of others did and said they saw some incredible sea life down there. The hours were speeding by so it was time to move on to our final stop for the day, and we anchored up just between two islands, the perfect place for a swim to cool off the late afternoon heat. 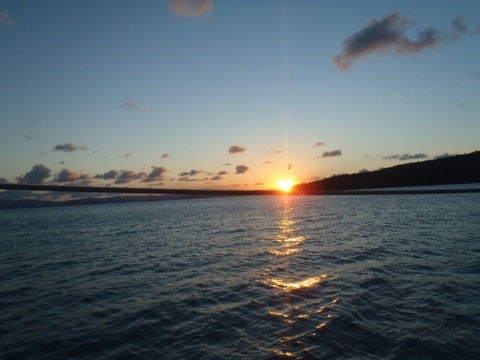 Everyone had an awesome time jumping, diving and even rolling off the boat into the water below, before Amy called us all in for a delicious dinner of spaghetti bolognaise and garlic bread, which we ate whilst watching the sun go down…the perfect ending to a perfect day. Once it was dark we cracked out the goon and the cards and played a few rounds of 4 Kings/Ring of Fire, before everyone slowly disappeared to their beds. Before long it was just the English and the Irish left outside (typical! ), trying and failing to play a few games (cards and wind don’t really mix) before giving up and just looking up at the starry night. After a few hours though everyone realised how tired they actually were and we all just crashed out. I tried to sleep outside on the netting but was woken at about 2am by a sudden downpour of really cold rain so rushed into the cabin and bedded down for the rest of the night. At about 5:30am the engine kicked into life (not the most pleasant of wake up calls, that’s for sure), and an hour later, Amy got us all up for breakfast. By this time we had left our calm, protected spot and were out in the open, choppy waters, not what you really want when you’re trying to move around inside the boiling hot cabin to get dressed, have your breakfast and brush your teeth. Let’s just say there were plenty of pale green faces in those early hours! 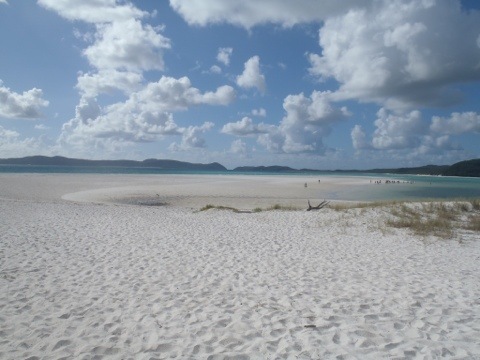 But after a couple of hours up on deck everyone seemed to be back to their normal selves, and by about 9am we’d made it to Whitehaven beach, apparently ranked the 2nd best beach in the world, and I can see why. When you step off the path onto the pure white sand and look out at this stretch of beach that seems to go on forever before it hits the sparkling bright blue water, you can’t quite believe that you’re not dreaming. It is honestly one of the most stunning places I think I’ve ever been, and swimming around in the warm water, surrounded by massive sting rays (just leave them alone and they’re not interested in you), with friends new and old…it couldn’t get any better. 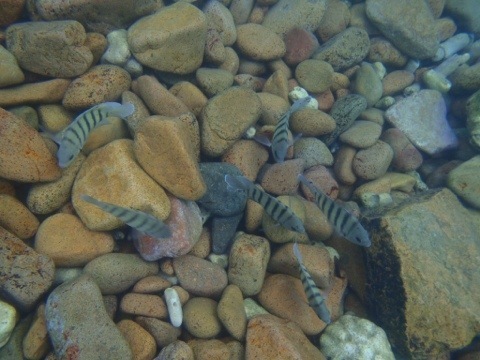 Unfortunately we had to leave Whitehaven sometime, so it was back to the boat and to another snorkelling spot. 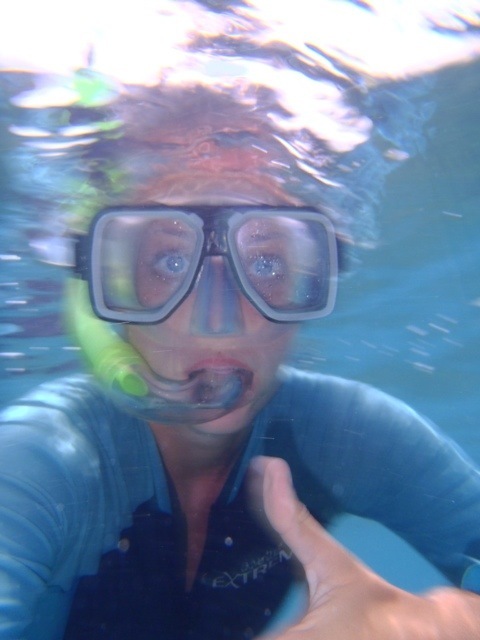 This time I overcame my fears and jumped straight in (after putting on my stinger suit of course), finding it not so scary after all…there’s some incredible sea life at the bottom of the ocean. 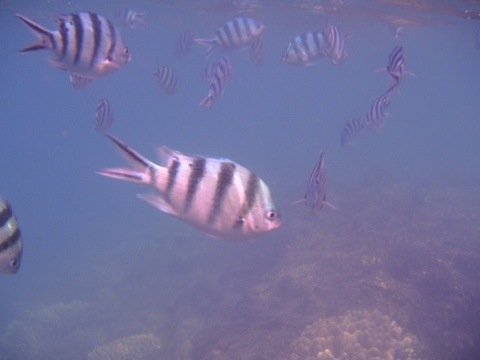 Then it was time for a bit of lunch and another snorkel in a new spot…this one was even better than the last. The sun was beaming down on the water so the coral was bright and colourful. There was one moment when I was swimming around and just couldn’t believe where I was, does something so beautiful really exist? Apparently so…we were there for quite some time, until we got freaked out by the hoards of jellyfish, that is. Okay, so we may have all been wearing stinger suits (and they were the type of jellyfish that don’t sting), but it’s still not that nice when you swim straight into a massive group of them…yuck! I got out of the water pretty sharpish after that! That afternoon it was time to hoist the sail up and do a bit of proper sailing (we’d just been using the engine up until this point), so everyone gathered and grabbed a bit of the rope and heaved, heaved, heaved. I of course, was the (self)nominated photographer for the occasion…they wouldn’t have wanted my (non)muscles anyway! Up the sail went and we were officially sailing. It would have been bliss had it not been for the grey clouds and the downpour of rain, making for very choppy seas and very slippy boat…we were all over the place! 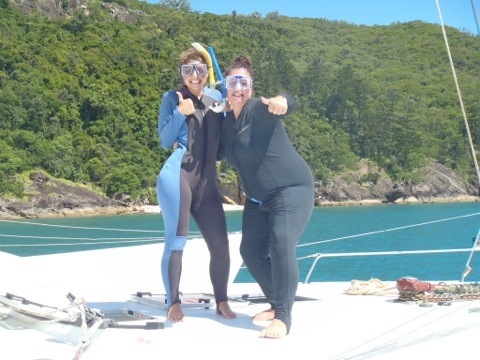 Eventually we reached our final stop of the day, and went for our last snorkel of the trip…this time we were actually snorkelling the Great Barrier Reef (an absolute dream come true for me), and oh wow, did it live up to expectations. 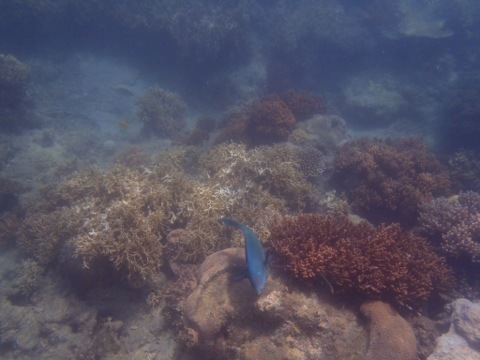 The coral was a mix of blues, greens, reds and purples, the fish came from all directions, in all shapes and sizes and colours..I saw things I didn’t even know existed! 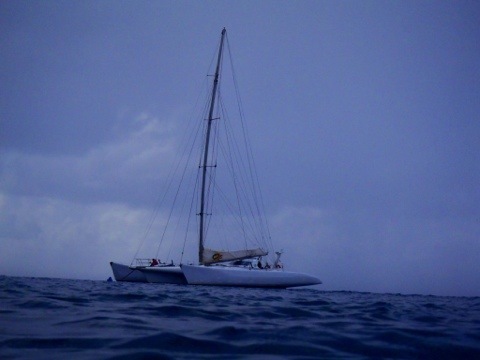 That night, after dinner, our boat got invaded by our neighbours…those on board another OZ Sail boat, ‘Mandrake’, came on board for a bit of a party for a few hours which was, erm, very noisy to say the least. I crashed pretty early on the netting on the other side of the boat and this time I slept there the whole night, only woken now and again by the cold or someone walking about on the netting, bouncing me up and down like I was on a trampoline! When I woke up at about 5:30am the next morning the sky was a beautiful shade of pink…unfortunately I couldn’t see the proper sunrise as it was being blocked by the island next to us, but it was pretty cool to see the sky go from dark to light all the same. We set off back to the mainland at Airlie Beach, having breakfast on the way, and arrived back on land at about 9:30. Our trip was over. I could have stayed out at sea for days, especially as I was just about finding my sea legs…24 hours later and I still feel as though I’m on a boat! 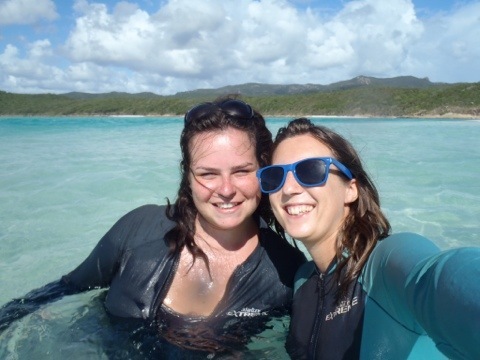 So if you’re ever in Airlie (or Australia), there’s nothing I could recommend more highly than going on a sailing trip around the Whitsundays. It’s something you’re likely to never do again, and you’ll see things you never imagined. In a word, it is epic. I can’t really describe it any better than that.